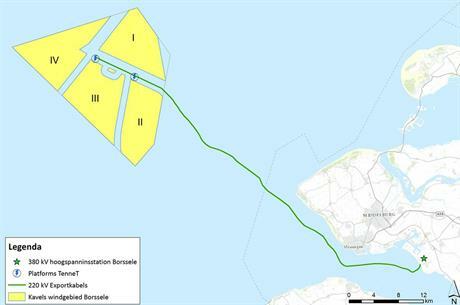 NETHERLANDS: A consortium comprising oil and gas giant Shell, offshore construction specialist Van Oord, and developers Eneco and Mitsubishi/DGE will build the 700MW Borssele III and IV projects at €54.50/MWh. The Dutch ministry of economic affairs received 26 bids from seven companies and consortiums for the development zone, and it was a mostly-domestic conglomerate that came out on top. MHI Vestas has been named preferred supplier for the project, according to developer Eneco. The sites are located 22km from the Dutch coast, close to the Borssele I & II projects. Bids were capped at €119.75/MWh for this second Dutch offshore tender of 2016. The first auction was won by Danish developer Dong Energy at €72.70/MWh in July. The new tender has resulted in a 25% reduction in offshore costs — excluding transmission — compared to the earlier auction. The minister of economic affairs, Henk Kamp, said the winning bid could mean the project is operated subsidy-free after 7.5 years. "If the electricity price develops as we expect, in 7.5 years' time subsidies will no longer be required for the production of electricity from offshore wind farms," said Kamp. "That brings the Government's aim for renewables to compete with fossil fuels without subsidy within reach. The Netherlands is a front runner in the development of offshore wind energy, creating many opportunities for the Dutch industry. With these winners this becomes even more clearly visible," he added. The Netherlands is planning auctions for a further three projects, each 700MW, and all to be operational by 2023.